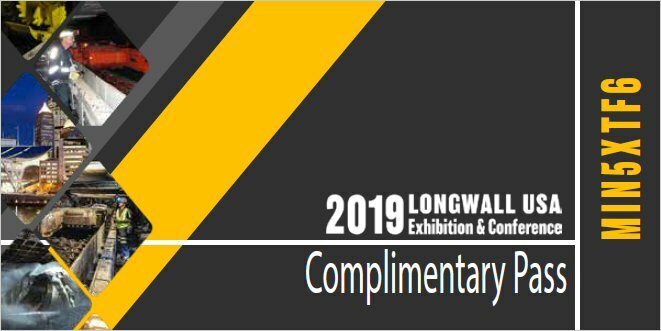 There are more than a few constants to the conveyor elements a mine manager and others are examining on an everyday basis: Is the line carrying the proper load, and at the proper spacing? Is there too much — or too little — maintenance being performed for the best lifespans of the components? Is an upgrade or replacement needed, and how will any of those adjustments affect the bottom line? It is expected for operators to have a flurry of questions about whether a mine’s conveyor infrastructure is as good, as efficient and as cutting edge as it could be. This is particularly true with a wave of new technology in the space from manufacturers answering the call from an industry seeking to do the best, produce the most, and have the safest line possible with the smallest amount of involved capital. A market forcing the same production levels with a greater pull on limited resources has created somewhat of a perfect storm. Conveyor engineering companies have be keeping up with the demand and listening to mines’ needs, be it at the working section or at the other end of the line where the product is loaded for transport. Below are just a handful of those forward-looking technologies. Joy Global engineering manager for conveyor systems Todd Kirkpatrick and marketing communications project manager Greg Chaffin, with more than a half century of conveyor expertise between them, have helped keep Joy Global at the forefront of conveyor technology for years, and have spent just as long listening closely to what the OEM’s clients have to say when it comes to the job their beltline is doing. One significant issue is increased loads and the need for greater capacities, but not at the expense of abandoning CEMA (Conveyor Equipment Manufacturing Association)-class compliance. The company’s response to that is a new engineered idler shaft that has just received patent approval (9,056,727) that can exceed load ratings for a mine’s respective CEMA idlers class by 20% to 40%. The idlers were first hinted at by Joy Global in mid-2014, but with the recent patent greenlight, the are now available for purchase to take on anything soft and hard rock mining can throw at them. Joy Global’s SDX 2200 and HD1500 help mines increase load without the typically significant increase in cost. Ideal for use underground or at the surface, the HD-1500 can be used in CEMA D applications up to a 1,500-lb load rating (D+). Its counterpart, the SDX-2200, is best for CEMA E applications up to a 2,200-load rating (E+) — bringing increased idler-load capacity without the upgrade expense that often goes with such a sizeable change. 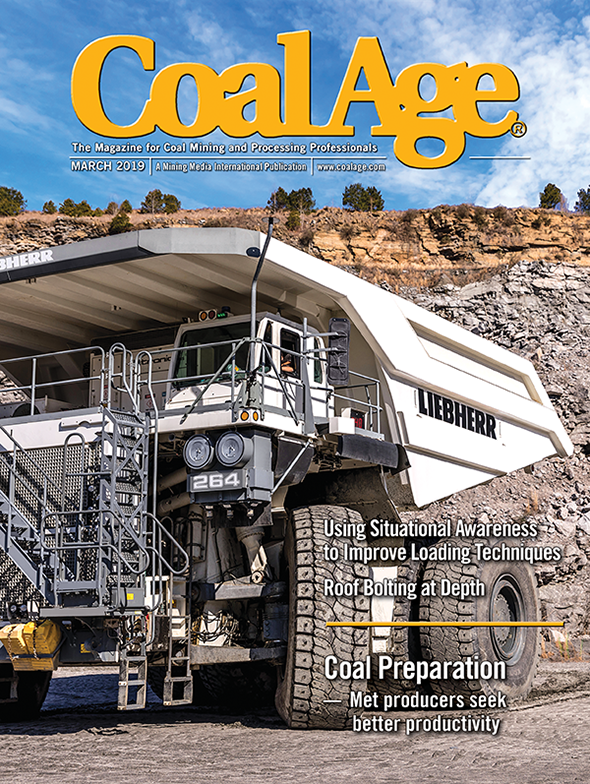 According to Kirkpatrick and Chaffin, in addition to bridging a gap between CEMA classes and possibly keep initial purchase costs down for its client mines, the products were also designed to help reduce installation and maintenance costs — think faster installation and removal and less work while the idlers are in place — while also holding true to its mission to design the safest products possible. For example, from a safety perspective, greater allowed spacing (when ideal to the specific site, the pair noted) equates to fewer idlers for personnel to transport, install and remove. What was a common scenario of whether to install a wider belt or increase load yield while decreasing spacing, both expensive avenues to take and with their own associated safety issues, now has another solution. For some operations, making decisions on belt line and the engineering and accessories that go into their respective design leaves even more questions, and many reach out for OEM support. Kirkpatrick and Chaffin said its Statix conveyor simulation software can help with those considerations, aiding mines in finding their optimum parameters. Efficiency, especially when a mine is searching for it, can be improved in a number of ways. Installation practices, and the speed at which the work can be completed, is just one of those routes. What if installation time could be cut by one-third? Calculating the savings of manpower and money alone is a boggling thought. Flexco believes it has the key to that savings with the introduction of its Pneumatic Single Rivet Driver, which it has designed for use with Flexco SR fasteners and installation bases. Richwood’s ON-Track at work in the field. There are no edge guides required for Richwood’s ON-Track system. Richwood’s design is proactive, avoiding scenarios such as this one, where the structure was damaged by a walking belt. The tool, initially released in 2012, seems to address all of the components a belt crew would ask for if they could design their own tool: a dual handle for balance and ergonomic gripping, a heavy-duty drive rod for high-quality splices and air-powered with a pneumatic driving force; a single trigger pull per rivet can save a mine time as well as reduce worker fatigue. Additionally, collated rivets with washers and a specially designed steel guide block ensure that each time the trigger is pulled, a consistent splice is made. The pneumatic single rivet driver, which comes with a portable carrying case for easy transport, is available now. One major issue Richwood’s clients tackle is that of belt side travel. According to the company, a new way of looking at the problem is needed which will change the perspective from correcting misalignment issues to preventing them. 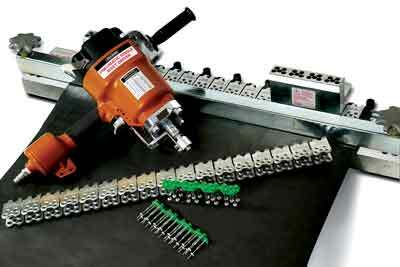 Flexco released its PSRD (Pneumatic Single Rivet Driver) tool this year. 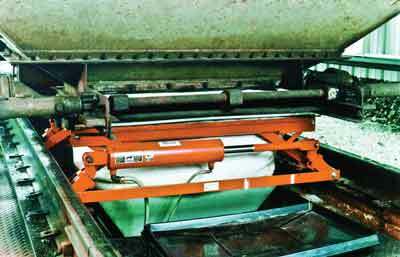 In many cases, conveyor operations use products that incorporate edge guide rollers; however, this can actually damage belting, which in turn will lead the operation to have to replace that belt prematurely. Additionally, the component’s pivots and swivel bearings have the potential to eventually seize, in turn becoming inffective and creating additional risk of belt damage. One thing that is a common denominator between conventional training idlers, Maloy noted, is in the heart of their design — to react to changes in the path of travel of the belt, including pivoting the idler bring the belt back to its center position. CEMA (specifically, the 7th edition) has outlined several conditions that need to be met for belts to remain in-path; these include a conveyor structure frame that is aligned and leveled; conveyor tail and head pulleys that are square and aligned on the conveyor frame; straight belt with square splices; belting that is in good contact with troughing rolls; troughing and return idlers that are square with the conveyor frame; properly tensioned belting; and centrally loaded material on the belt itself. There are times, Maloy said, when all requirements can be checked off from that list, and even be realistically accomplished, but still the operator is left with an issue. It is that time that thinking outside the box may become the next step. Richwood has had great success doing just that, as it outlines in two field case studies. Their solution: the ON-Track Tracking Idler. One of the largest coal preparation plants in northern West Virginia was facing constant problems with belt tracking and misalignment. Side travel of the return belt was extreme. System inspection confirmed that the belt tracked as far as 12 in. off-center in either direction entering the mid-positioned conveyor drive. Even though the conveyor was being correctly loaded in the center, belt tracking varied depending on percentage of load on the conveyor. Approximately 75 ft ahead of the drive area, there was evidence that the belt had been rubbing the structure on both sides of the conveyor (see adjacent photo). Costly belt edge damage was a major concern due to the frequent contact with the vertical I-beam structure supporting the drive. 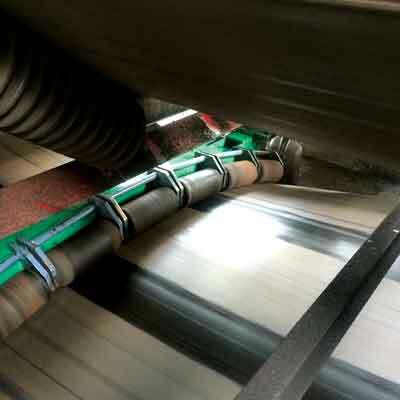 As a result, multiple conventional training idlers were replaced with a single ON-Track unit entering the conveyor drive, eliminating belt misalignment and the consistent problems on this conveyor. The SHD 1200 Series Cleaner features a special tensioner system. 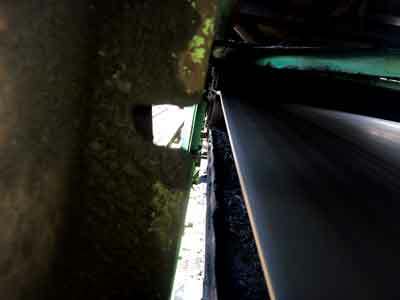 In consideration of this new method of controlling belt tracking, a large coal producer in southwestern Pennsylvania elected to install the ON-Track Tracking Idler on a large overland conveyor system where they were experiencing persistent problems. The unit was installed about 30 ft prior to the conveyor’s mid-drive. Once in place, the belt immediately centered itself in the tracking unit, reducing side travel from 10 in. to no more than 2 in., even with a misaligned vulcanized splice in the system. Under variable loading conditions, testing confirmed the path of the return belt was positively controlled at all times. There have been no other belt trainers required or belt tracking issues since installation of the unit. So how does Richwood’s On-Track work? The system design is proactive instead of reactive, focusing on prevention of belt side tracking and misalignment instead of just correcting a belt misalignment after it occurs. The unit’s multiple roll design also creates a smooth arc to aid in guiding the conveyor, with tension meanwhile getting gradually greater in the areas closer to the edge. Illinois-based Martin Engineering has had a busy year, with several updates to its current line as well as new product additions for mines of all types. 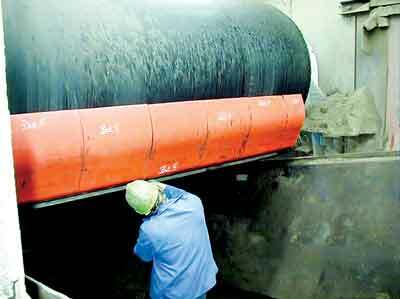 Just last month, the company introduced its family of SHD super heavy-duty primary conveyor belt cleaners designed for severe operating conditions. Martin’s SHD Cleaners were engineered for fast and heavily loaded belts. Designed for fast, heavily loaded belts being kept up by crews seeking out a long service life and minimal maintenance, Martin’s cleaner line has been proven on belts up to 10 ft (305 cm) wide with speeds as high as 2,000 fpm (10 meters/sec) and carrying loads of up to 300,000 tpd. They are also designed with the company’s patented CARP technology, which provides constant angle geometry to match the pulley diameter accurately across all stages of service life. The urethane blade offers up to 42 sq in. (271 sq cm) of wear surface — more than seven times the wearable surface of standard cleaner designs. A range of color-coded and high-performance blade choices are available for many specific applications and materials. The Martin SHD Series was developed for super heavy-duty applications. “The extremely durable construction helps eliminate carryback, reduce emergency outages and minimize unscheduled downtime, product engineer Daniel Marshall said, adding that, in some applications, it has been shown to be the only design that can withstand the severe operating conditions. Currently available are the SHD 1200 Series and the SHD 600 Series cleaners. The SHD 1200 line has been engineered for high-speed conveyors that have a head pulley of 48 in. (122 cm) or more in diameter and belt widths between 42-120 in. (107-305 cm). The blades are up to 12 in. (30.5 cm) in height and are made of a heavy structural steel frame, and the cleaner was designed along with a tensioner system to provide effective cleaning and reduced service requirements. It is fully compatible with reversing conveyors and belts with mechanical splices and has a service temperature range of -30 to 300°F (-34 to 149°C). SHD 600 Series cleaners are also installed at the primary position, but in this case the units are ideal for pulleys smaller than 48 in. (120 cm). 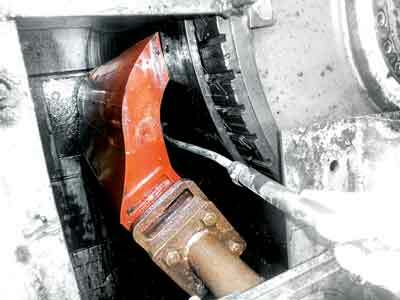 Installed on the track flanges, Martin’s boot rises to the unloading gates for unloading of bottom-discharge hopper cars of connecting hopper cars to under-track conveying systems. The Martin Engineering design team has also recently tackled the far end of the conveyor’s journey with its new Boot-Lift railcar connector for faster and safer unloading of material from bottom-discharge hopper cars where they connect to under-track conveying systems. Built to prevent material loss and contamination (and without workers having to crawl under a railcar), the new released can be installed on the track flanges and powered by an air-over-hydraulic design. The boot rises to the unloading gates for clean, efficient unloading of bottom-discharge hopper cars, and added sponge seals can fit securely to the gates for a clean transfer of material to the conveying system. Connector models, available now, can be used with any bottom-discharge railcar design, including single- and double-opening, round-opening and GATX. Adaptor sheets and transition funnels are also available for interchangeability as needed. “Users can convert various car models from double- to single-pocket unloading or single to double by simply removing the standard sponge seals and replacing with the appropriate funnel and adaptor sheet,” he said, adding that the units require just 1 CFM of air supply at 90 PSI (28 LPM at 6.2 bar) for operation. The Boot-Lift manual aligner delivers up to 6 in. (152 mm) of total adjustment, or 3 in. (76 mm) in each direction along the track. The pneumatic model gives up to 8 in. (203 mm) of total adjustment, 4 in. (101.5 mm) in either direction. Remote control requires just 10 PSI (0.7 bar) of compressed air. The units come standard with black vinyl-covered cloth, but other options, including polyethylene-lined; white synthetic rubber-coated cloth; food-grade polyethylene-lined polypropylene; and flame retardant coated polyester are available. 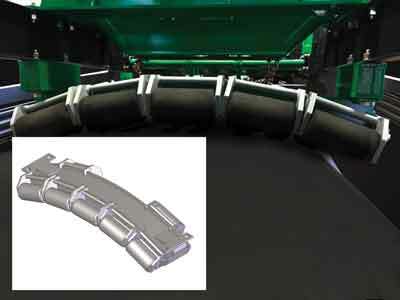 Resulting from feedback the company received from customers, ASGCO has unveiled the Razor-Back Retractable system that site crews can access as needed from outside a line’s chute but without breaking the plane of the conveyor. Expanding on its existing Razor-Back cleaner line, the new series can reduce downtime and even eliminate the need for confined space permits. It has been designed with resilient blade support to absorb even the most severe shock, and the blades can run independently to maintain contact with the line. Ideal for coal-fired power plants as well as steel mills, iron ore, hard rock mining and aggregate and mineral mining, the Razor-Back Retractable system has universal mounting for easy installation and is available in both tungsten carbide and HD400. Less than 9 in. of clearance is needed to install the system and to maintain it, especially with the company’s Quick-Change slide-out mounting design, and it is safe for mechanical splices and belt speeds up to 1,000 fpm (5 m/sec). ASGCO has stamped its Total Satisfaction Guarantee (TSG) to the newly released system, which is available now.